Bethel Early Learning Center has grown from an infants only care provided from my home to now include toddlers and 3-5 year olds in our newly renovated center conviently located in Bethel Station next to the Casablanca Cinema. 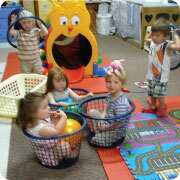 We provide a safe and healthy environment where play is learning and learning is fun! Our Infant/Toddler program follows Maine's Infant/Toddler Early Learning Guidelines. We follow Maine's Early Learning Guidelines for 3-5 Year Olds. All of our staff are certified in Maine's Early Learning Guidelines for 3-5 year olds and Maine's Infant/Toddler Learning Guidelines. We are committed to continued training in all areas of child development.